You can always rely on the much-loved NFL Commissioner to spoil a party. So it should not come as any surprise to those of us hoping for a Raiders move to Las Vegas that Roger Goodell poured cold water on the project. Speaking at the NFL Fall meeting in Houston, he said the league had ‘miles’ to go’ before it would give the go-ahead for a franchise move to Vegas, and he wasn’t talking about the 410 miles separating the two locations. 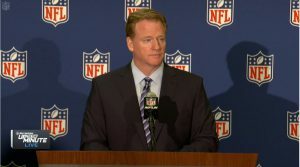 “There’s still a lot of information we need to gather,” Goodell said to reporters, “We need to study everything necessary for the long-term health of an NFL franchise. Like is there a fan base there? Is the stadium economics and fan experience at the level that we need? What is the impact on NFL policies?” He went on to refer to evaluation groups, surveys and a plethora of other stalling techniques beloved of grey-man committees up and down the land. At least Goodell didn’t flatly rule out a move and even suggested The Membership vote might be more important than his own opinions. Meanwhile, Mark Davis has been reassuring Nevada State Governor Brian Sandoval that he wasn’t using the possibility of a Vegas move as leverage for a better deal elsewhere. “If they come up with what we’re talking about, we’re gonna move to Las Vegas,” said Davis.